What Does a Week in Uruguay Look Like? There are three types of rappelling that we would be doing: rappel down a slope, rappel down a vertical ledge and rappel where you must lower yourself down to the ground, which in this case meant hanging off a bridge and lowering yourself down to the sidewalk next to a busy road. As scary as this all sounds, once we learned how to use the equipment and proper technique for each type of rappel, it was a lot of fun! 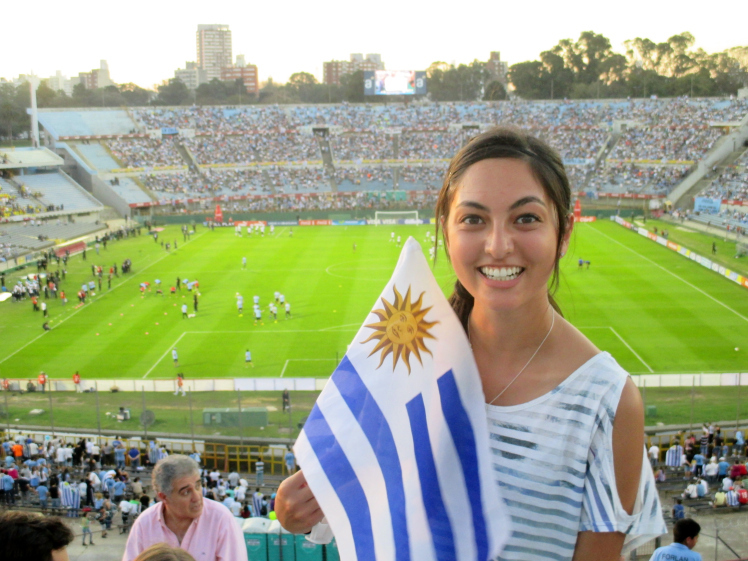 On Tuesday, the Uruguayan fútbol team had a game against Colombia as part of the World Cup qualifying matches, and I was able to go! Uruguayans are crazy about their fútbol. The stadium, which holds about 65,000 people, was practically sold out. Everyone was very spirited in their jerseys, crazy blue hair, face paint and wearing the Uruguayan flag like a cape. I even had my own little flag! The first half of the game was pretty uneventful, and the score was zero-zero at the half. We were anxious for something amazing to happen, and we certainly got our wish. During the second half, within about three minutes of each other, Uruguay scored two goals. The crowd went wild! Cheering, chanting, blowing horns, lighting firecrackers and jumping around, it was pure jubilation. Overall, Uruguay won! There will be another game in Montevideo in October against Argentina, and I would really like to go to that match as well. Thanks, Rikki! 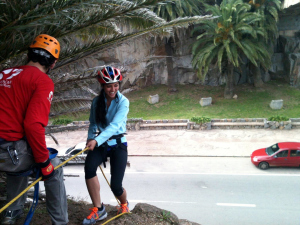 Think that rappelling and fútbol are the right fit for you? Study abroad in Uruguay. Talk to your study abroad advisor and visit the ISEP website for more information. An earlier version of this post was originally shared March 5, 2014. Blog Getting Lost in Language While Studying Abroad ISEP student Dantae H. is a part of ISEP Voices Spring 2016. She is a Spanish language and literature major from Roanoke College, and is currently studying abroad at Universidad Alfonso X el Sabio in Spain.